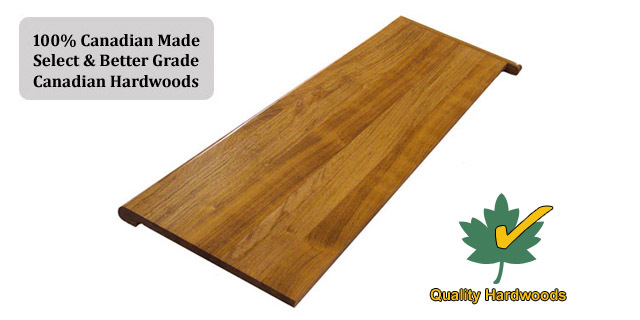 Buy Solid Hardwood Replacement Stair Tread Caps Direct At Discount Prices - Canada Made! Wood Types: Oak, Maple, Birch, Knotty Pine, Cherry, Jatoba, Etc. - Standard & Custom Tread Caps. Prefinished False Stair Treads In Our Spray Booth Or Unfinished If You Wish To Do This Task Yourself. 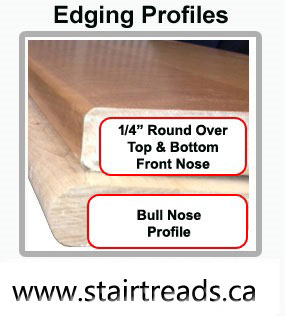 This unique wood product the full replacement stair tread cap allows the DIY'er to accomplish that look he/she longs for without doing a total staircase tear out. This is a great solution for those beat up basement stairs or for any stairs that you wish to re-tread, without doing a full tear out. A full false stair tread is designed to go over an existing tread ( actually it's a 'Solid Cap Tread' ) thus this product is the perfect solution for renovation jobs. 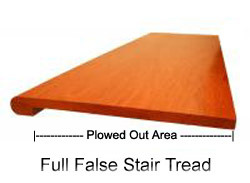 As Featured In "New Homes & Renovations Consumer Publication" : The Full False Replacement Stair Tread A Unique Product Made For the DIYer.